London wedding photos with a colourful, creative style. London is a wedding photographer’s dream; the incredible variety of awesome people and places throws up so many opportunities to capture wedding photos that are truly unique and really varied. 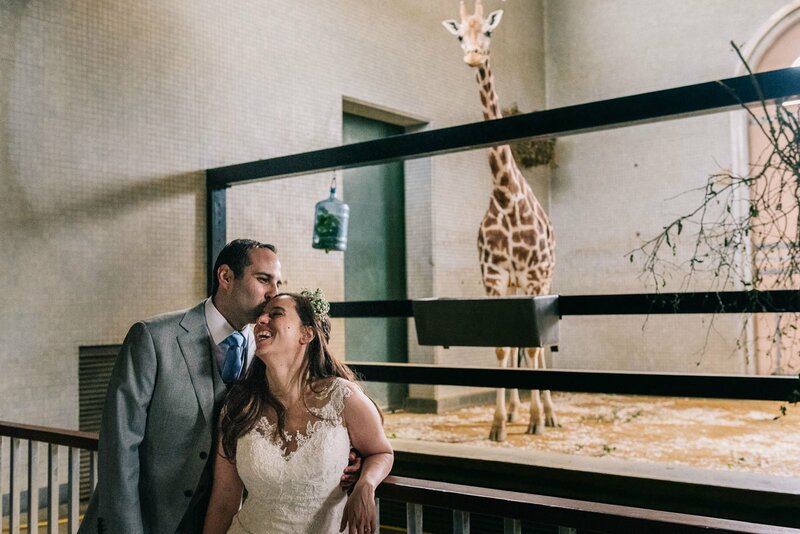 From classic London architecture to gritty London streets (and even the zoo, as featured above!) I really love the diversity that London offers. Nobody wants a wedding photographer to just turn up and go through the motions taking the same shot they’ve taken a hundred times before. And we photographers don’t want to do that either! I love to be inspired by the environment I’m shooting in and London is a bit like a playground for wedding photographers – it’s impossible not to find opportunities to create amazing photographs where ever you look. I feel a bit of a fraud waxing lyrical about weddings in London when I recently defected to Bath, but I still return to London most weekends to photograph weddings and engagements and I love being back in the city. On this page you’ll find some really cool stuff like a collection of my favourite wedding venues in London, reviews from happy couples and links to my most recent London wedding photos. 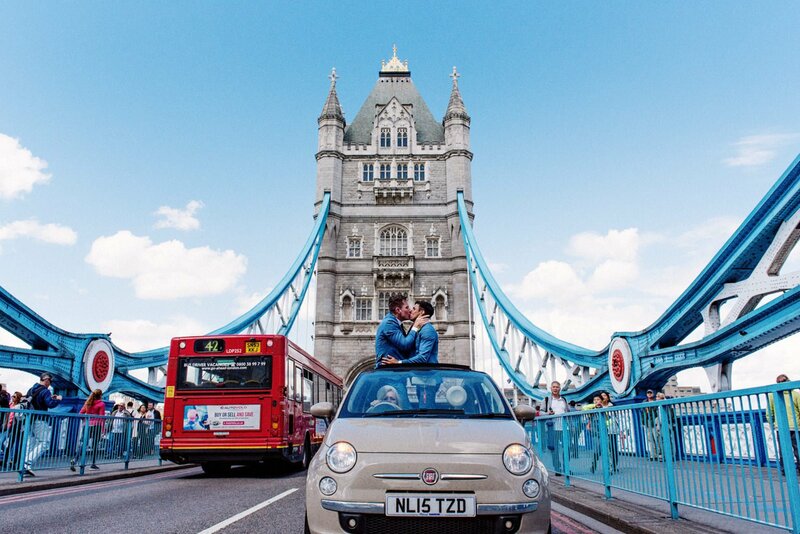 If you’re looking for a quirky, creative London wedding photographer please get in touch. I’ve photographed a lot of weddings at Islington Town Hall. A lot! It’s a hugely popular venue for tying the knot before moving on to a pub or warehouse wedding reception. Not only is it my most photographed venue, but that Islington pub or warehouse combo is really popular with laid back couples who are looking for alternative wedding photography. I also love Stoke Newington Town Hall and Chelsea Town Hall where, again, I’ve shot dozens of times, usually followed by a trip on an iconic London bus. I’ve also had a lot of fun shooting at Trinity Buoy Wharf – another venue that coples head to after their town hall ceremony. It’s probably a bit to do with London, and a bit to do with the kind of couples that are looking for my creative/alternative photography style, but I don’t get an awful lot of church/hotel weddings. I’m open to shooting anywhere really – and the more creative the better. I love it when someone calls me or emails saying they’re thinking of a really quirky venue. Here’s a handful of reviews from weddings I’ve photographed in the capital. Without bigging myself up, I could add a load more but I figure maybe you’ll get the gist and want to get on with looking at my back catalogue! If you do want to read more reviews give this link a go and click on the reviews bit in the Babb Photo box or check out more raves here. 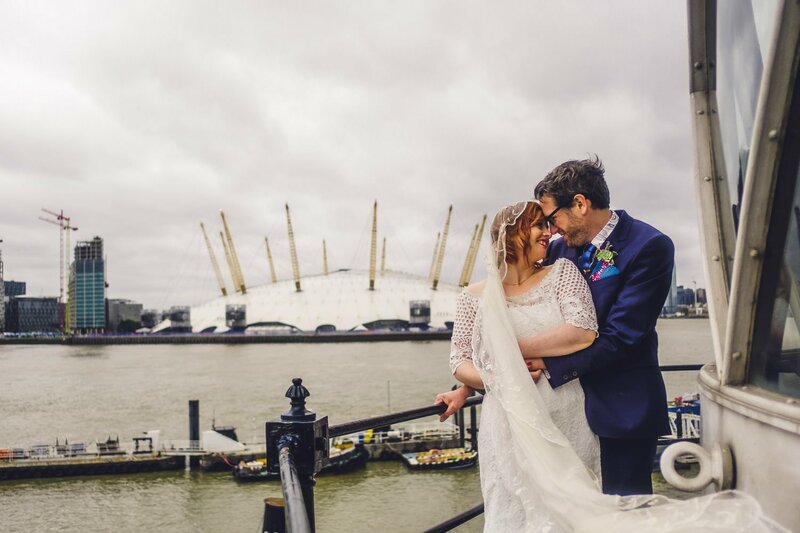 Laura did an amazing job photographing our London winter wedding. Our wedding photos are stunning, and they really capture the spirit of our day in Laura’s unique and artistic style. So many people have shed a tear or two whilst looking through the photos. Not only are the photos brilliant but Laura is a genuinely lovely person, who will put you at ease, whilst being thoroughly professional and efficient so that you always know what is going on. Everyone has also commented that she was also very discrete on the day and often you forgot that she was there even though she captures everything you could hope for! She has fans for life and we will be keeping an eye on her wonderful blog! Laura is a wonderful photographer. Very friendly, professional and approachable. She made everyone feel at ease and the whole process of snapping our special day flowed effortlessly. Her creative take on the surroundings she is presented with meant she captured some truly memorable and unique photographs that we will treasure forever. Laura was the first and only photographer we considered for our wedding, as soon as I found her website I knew she was the one! I’m so pleased I went with my gut as we absolutely LOVE our pictures and Laura a pleasure to work with. Even though we knew the pictures were going to be amazing, we were actually quite bowled over by the final product and looked at them at least 30 times in one evening. Thank you so much Laura for your hard work and capturing so many wonderful memories for us in such a creative and beautiful way. Check out my latest London wedding photos. They’re listed in date order so bear in mind that my style is really in line with the more recent stuff. If you go back too far you’ll find the raw, embryonic Babb Photo style. I’m super proud of those photos but it’s the latest stuff that I hope will blow your mind! I get booked up pretty quickly so if you’re looking seriously for a London Wedding Photographer or you’re just making a shortlist – it’s worth reaching out to me now. The reviews you’ve read and the galleries you’re about to browse all started with a call or an email. Don’t be shy!